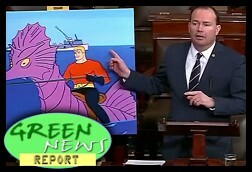 " 'Green News Report' - March 28, 2019	"
"We're seeing, I think, a real tectonic shift taking place in the Republican Party away from blanket denial into they-don't-know-what-yet," Sen. Sheldon Whitehouse (D-R.I.) told reporters after the vote. "And it's going to be interesting to watch them as they move to whatever their next fallback trench is in this long battle for their fossil fuel funders." Fossil fuel interests have given over 11 times as much dirty money to senators voting against the Green New Deal resolution than to those who voted “present” to block McConnell’s cynical ploy. Today’s report updates the group’s 2016 report that estimated these companies spent $115 million a year lobbying against climate regulations — even policies companies said they supported... The new estimates suggest that spending to influence climate policy by the five oil giants has increased sharply over the last two years. The research has dubbed this inflection point the “coal cost crossover.” And many aging coal plants in the U.S. are on the wrong side of it...The findings show that retiring 74 percent of American coal power plants and replacing them with wind or solar plants would provide an immediate saving to utilities. « PREVIOUS STORY "Might Brett Kavanaugh Actually Help Bring an End to Partisan Gerrymanders?! : 'BradCast' 3/27/2019"
"'Green News Report' - March 28, 2019"
The Jakobshavn glacier in Greenland is said to be changing in the direction of another 'Little Ice Age' by those who care not to know reality. As in financial net worth, the bottom line is the one to sing about. Ice sheet mass balance is the subject those who can’t fathom this issue need to study. Lot’s of comments with little value by those who also can’t balance their own check books is telling.